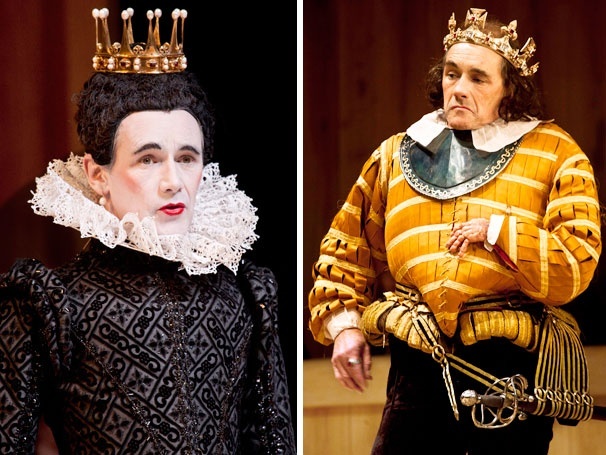 My first blog post of the semester focused on the Globe’s productions of Richard the 3rd and Twelfth Night which are now playing on Broadway in rep. The meat of the blog centered around the choice to do both plays with all-male casts and whether or not it was being used as a marketing gimmick. I was fortunate enough to get standing room tickets for both shows this past weekend, and figured this would be a good time revisit that first post through the lens of now having seen both productions. In short, to answer the question I posed in the previous post about the purpose of the all-male ensemble, I can now safely say my assumption was correct. It wasn’t a gimmick at all. Quite the contrary actually. Both plays felt more like educational experiences than broadway spectacles. As you enter the Belasco Theatre, twenty minutes before curtain, you’re greeted by the sight of the entire ensemble onstage getting into costume and hair & make-up. The actors warm-up, interact with each other, and converse freely with the audience sitting onstage in boxes made to resemble those of the Globe. The theatre feels more like a town meeting than a formal night at the theatre, and as the stage hands come out and light chandeliers of candles to light the stage along with the minimal stage lighting (that, with the house lights being kept low instead of completely off, doesn’t change throughout either show) The actors begin the play. The free form comfort that these actors have with the language is truly awe-inspiring. I was never taken out of the world of the play by any one performer or technical element, because everything was presented as being nothing more than it was. The sets were all movable – chairs, benches, blankets, – the props were all simple – a sword here and there, a letter, etc. The productions were designed so to be as historically authentic as possible. And since that was accuracy was at the forefront of both plays I could put aside my qualms with not having a coed cast, and enjoy the plays for the stories they told, and the community they fostered within the theatre. Among the mastery the performers had over the language was their ability to let the audience be a part of the story. They found any opportunity they could to make asides, to include the audience as much as possible, and keep checking in, sometimes even at the cost of emotional investment. I’m speaking specifically of Mark Rylance (brilliant both as the title character in Richard the 3rd and even more impressive as Olivia in Twelfth Night) who took some of the moments in Richard I’ve seen actors play at the height of their emotional dial, as an opportunity to address the audience and cleanly lay out the character’s opinion on his deeds and the next steps of his plan. It’s moments like these which made both shows incredibly clean. There was a generous quality the performers had. They wanted to tell a story, but they were more concerned with the audience understanding it, than their own performative agendas. One of the most interesting aspects of the production, however, was in the playbill. Earlier in the semester we had a discussion in class about the lack of dramaturgical notes in Broadway playbills due to how expensive they run to print, etc. The playbill given out at both productions (the same program serving double duty) included a page long explanation of costuming accuracy with the production and its effect on the performing of the play, and a page on wig and make-up use in Elizabethan theatre and how it was used to distinguish, not only gender, but status, and sometimes disguises. 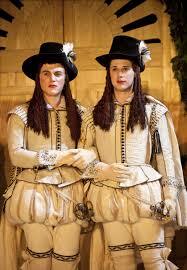 This helped a lot when it came to Samuel Barnett who played Viola in Twelfth Night who disguises as a male page. We as an audience are never supposed to forget Viola is a woman, but how do we do that when the actor playing her is a man? His wig stayed the same, as did his white make-up and his voice affected only slightly higher than his natural register, to suggest the character’s youth. All that changed was his costume and an added hat. The cast and creative team put the language front and center and did their best to recreate a night at the theatre in the early 1600’s. Of course we do lose something vital not being outside, at the Globe where these shows premiered, or even in London, but if this is the best we can do while staying in the states, it’s still pretty terrific.